Home Asus Asus PadFone Tablet Pics was Exposed! Asus PadFone Tablet Pics was Exposed! Last week, a few images of Asus’s new device which will debut at Computex 2011 revealed. 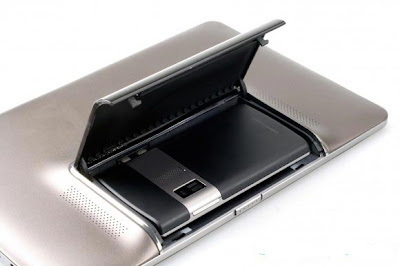 The new device called PadFone hides a smartphone inside the back of a tablet, and you can have the best of both worlds. The PadFone comes fully equipped with a secret compartment for the docking of Asus -branded Android phone. Nothing is known about how the two devices will pair, but a design like that offers a lot of possibilities. The details of PadFone will come when Computex kicks off this Tuesday.